Young Knights Blog Tour, Book Review and Giveaway! 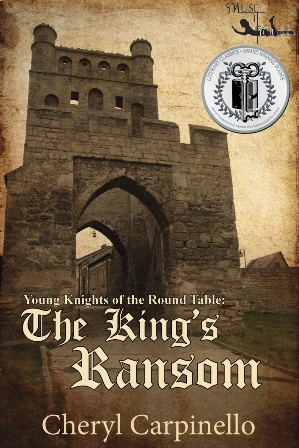 I’m delighted to be part of the blog tour for Cheryl Carpinello’s The King’s Ransom, the first part of her series Young Knights of the Round Table. I was attracted to the book some time ago, so I already had it secreted on my Kindle before I was offered a review copy! This is a well-constructed, exciting story of three friends from very different social backgrounds, set in West Wales in Arthurian times. Gavin, Bryan and Philip band together to clear their mysterious friend who has been framed for murder and the theft of a priceless jewel, the King’s Ransom. I love the way the three are introduced, each in their own chapter, giving their background, their hopes and their fears. As misfits, they are drawn together, and guided in some of their more ambitious studies by the Wild Man. The castles, and the rivalries between different ones, are beautifully described. You really feel you are standing on those castle walls or ducking under rough-hewn low stone entrances. I was slightly distracted by Philip’s journey to St David’s Head, where he stood on the headland in a storm and got buffeted about a bit. In my experience, he would have crawled on hands and knees up the hill and lain flat hanging on for dear life, so as not to be blown away! It’s really exposed up there, even in a mild day! The distances ridden by the friends needs suspension of disbelief as well, but then I’ve never ridden from Pembroke to St David’s Head, and Cardigan Bay covers a huge area so maybe it’s ok, if they only had to go as far as Cardigan itself. It is a highly enjoyable story with plenty of tension and the added comfort of a mysterious seer who gives each of them a bit of advice. The characters are well drawn, the pace is good, and the sentence structure and language choices should encourage reluctant readers. I found it a quick read, but an attention-grabbing one! Philip turns out to have a secret, which is an interesting twist at the end, but I can’t help feeling that those who identify with him during the adventure might be let down by it. I certainly didn’t see it coming. There will be more in this series, so we will find out how necessary it is to the plot. Read on for more stops in the tour – and the $25 Giveaway!! How to enter: Enter using this Rafflecopter link.